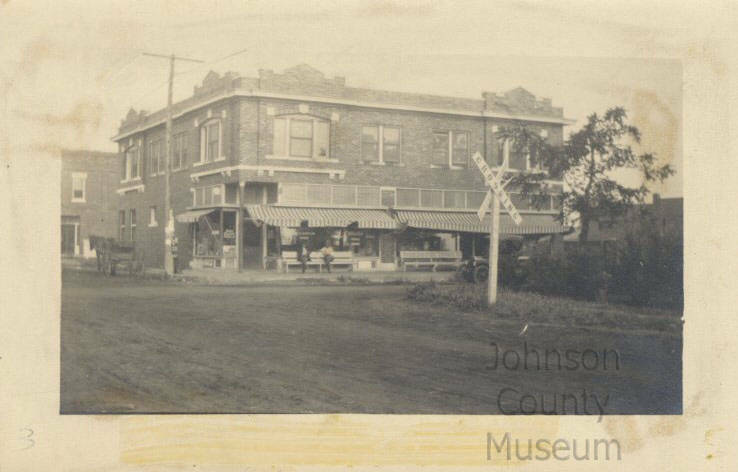 Today’s trip to the past of the Johnson County,KS takes time travelers to historic downtown Overland Park. Black and white photo of the Voights building at 80th and Santa Fe Dr. taken from opposite corner showing intersection of the two unpaved, dirt streets. There are two men sitting on bench outside of drugstore. A horse-drawn carriage is parked on one side of the building and an automobile is parked on the other visible side. The building itself is brick with striped awnings over the windows and doorways. There are several large windows at the store front. The window behind the men on the bench says “DRUGS.” Also visible in this picture is a wooded “Rail Road Crossing” sign, a telephone pole, a tree, and another brick building in the background. 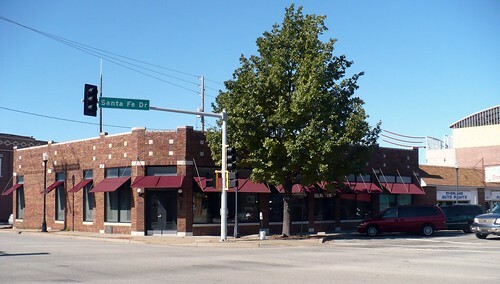 Apparently Voights Building (1911-1927) burned in 1927 and was rebuilt as a one story building where law offices are today; we also find out that it was located at the North-West corner of 80th and Santa Fe. Another mention of the historic building is here. This look at the past was brought to you by the Kansas City Lunch Spots : Where Lunches and Spots Meet In The Open. Also sponsored by: My Job: Weekdays Off, WTF. Additional financing by: Old People: We Were There When the Old Building Burned.